This guy is hanging on my wall this morning. His legs, as you can see, are bright green and his body looks like a halloween goblin! I’d just finished reading her post about the blog tour when this strange looking arachnoid appeared! Today Susan is featured at Cocktails and Books, an online book review and book club blog. What an interesting way to promote a book these days. In fact, if you are a writer, you might want to look into this type of marketing at Pump Up Your Book, a virtual book publicity service. You can also get a schedule for the rest of Susan’s blog tour there. 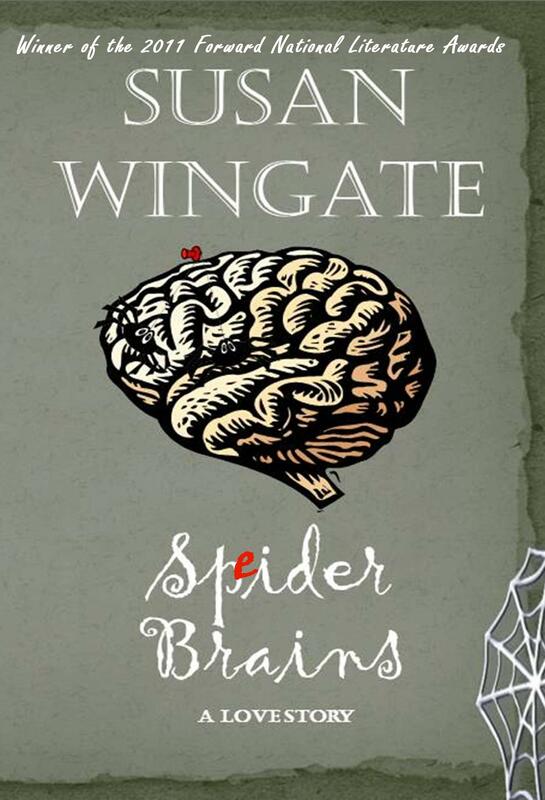 I haven’t yet read “Spider Brains,” though I have read Susan’s 2011 adult release, “Drowning,” which won national fiction awards…in fact, it seems as though all her books win awards. She’s pretty funny too…you might just want to follow the comedy of her life (click on blog at the top of her home page) and the writing challenges she posts of Facebook. Check it out..as far as I can tell, all Susan’s books are available on Kindle and other electronic devices….and she’s really interested in other writers’ success and evolution. A golden quality, among all her other good stuff! Meanwhile, I think I’ll try to find a way to put the green-legged monster outside. He’ll be happier there.